A group of aging Cubans reunite when one of their friends returns from exile in Spain. Although the technology was tentatively available from the medium’s dawn, the use of sound in film was not properly established until around 30 years later (you know, in The Jazz Singer). In diametric opposition to the theatre (its closest cousin), cinema was a kinetic art where dynamism and exaggerated expression made meaning, the early manifestations of which (the Lumiere brothers’ train, for sensational example) conceived the light and energy which would eventually manifest in our modern blockbuster cinema of spectacles; vision as pleasure. Within the less image led mediums of theatre and literature, dialogue has such precedence that it exists as an actual genre, wherein a conversation between two characters is used to present and explore philosophy and ideological treatises. For the main part, dialogue within cinema is perhaps a little different; if in plays dialogue is projected and fosters the drama, in cinema we overhear the dialogue, which is more frequently used to compliment the action (and often manifests in killer signature lines which enter the ether with iconic resonance, like my favourite: ‘That’ll do pig’). More akin to theatre than cinema, Laurent Cantet’s film focuses on five Cuban friends who, upon the occasion of one of their number returning from self-imposed exile in Spain, spend the evening, and the night, reminiscing, discussing and, eventually, revealing secrets over shared beer and the sea air. Return to Ithaca’s setting is not incidental - the dialogue often refers to Cuba as a unique political province, warts and all. The five pals - a mix of artists, doctors and factory workers - are in late middle age, and have suffered/enjoyed the duration of Castro’s regime (the film was made in 2014, when the dictator/people’s champion was still knocking about). As opposed to a coming of age tract, Return to Ithaca is a came of age movie, essaying that inevitable spiritual impotency when youthful fire burns out into the smouldering comfort of dotage. Lead Amadeo (Nestor Jimenez) has writer’s block, while artist pal Rafa (Fernando Hechavarria) finds it hard to paint and has consequently hit the bottle: ‘We’ve turned into old farts, haven’t we?’, a comrade ruefully observes early on in the film, establishing Return to Ithaca’s lachrymose tone and echoing the usual sentiment that older people always make in these sort of films (that Big Chill thing where characters are primarily defined by their age). Distinct to a chamber movie like, say, Twelve Angry Men, where dialogue motivates plot and directly leads to resolution, Return to Ithaca is more akin to sitting across the way from a group of people in a bar. The conversation is of the meandering sort, gradually (oh so gradually) excavating the secrets and lies which infect this apparently jolly bunch. Essentially, they get pissed and it all comes out. ‘Home truths’ are directly mentioned, which (via the death by cancer of one of their previous number) is associated with Cuban ideology and the gangs’ various acceptances of it; they ‘loved their revolution’, but also observe the hundreds who died escaping ‘in plastic bags’, recognising that they too are ‘cogs’ in the socialist machine. However, this sort of subtextual talk leads to tension between the ostensible naturalism of the dialogue and its deliberate observation of social history, undermining the otherwise breezy realism of the film; ordinary conversation often doesn’t neatly reflect its ideological context! Furthermore, the familiarity and supposed history of the group is so perfectly realised that the audience may well feel slightly distanced from the gang as they share well established in-jokes that slowly reveal the tensions beneath. Based on a play (and despite its lovely outdoors setting where we can scent the salt in the air and see the peeled pastel of the surrounding buildings), Return to Ithaca may well have stayed within its original medium. Lacking the intimacy of theatrical presentation, the wide exposure of the screen overwhelms the conversational dialogue of Cantet’s movie. There are gentle joys to be found here, and, yes, you will probably feel like ringing up your own friends and giving them a hug after seeing how time and circumstances alter relationships, and being confronted by the eternal truth, which Return to Ithaca recognises, that, ultimately, we only ever have each other. However, the static nature of the action and the dialogue may also make you wish that you had spent the running time catching up with your own mates, rather than these jaded strangers. 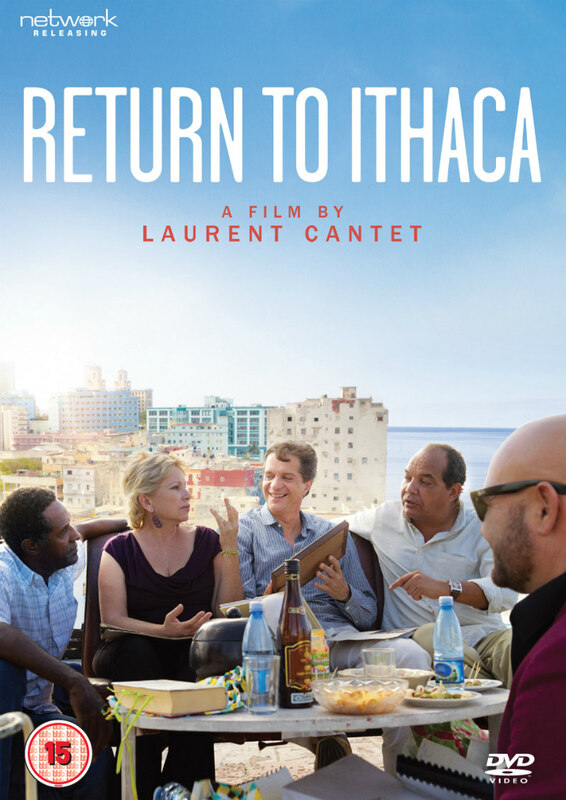 Return to Ithaca is on DVD September 25th.